One of the new names proposed for John H. Reagan Early College High School is Barack H. Obama. The Austin Independent School District’s Board of Trustees is scheduled to vote Oct. 22 on the proposed new names for four AISD buildings named for Confederate figures. After a long dispute about whether the buildings commemorated the state’s struggle with racism and inequity, the board voted 7-2 in February to change the names. The buildings to be renamed are Eastside Memorial, Lanier and Reagan high schools, The Allan Center, and Fulmore Middle School. A committee at each building came up with new names. The committees – comprised of teachers, parents and community members – submitted their top three choices to the board. This building in East Austin is a former elementary school that the district now uses for a pre-K program and offices. The only name the committee submitted for the Allan Center is Anita Coy. According to the district, Coy was a principal at Allan Elementary for seven years before she became an area superintendent. She served AISD for 20 years and started a fellowship program for first-year teachers. The committee said she was well known for her genuine character and hands-on approach, and that she often greeted families personally. The first choice of the committee is to rename the school after Sarah Beth Lively. Lively was a teacher at Fulmore for 25 years. She was also mentor to journalists on the school paper and continued to volunteer with these students even after she retired. Lively led her journalism students to win University Interscholastic League competitions against high schoolers, and she was reportedly known for her loyalty and love for the school and her students. The committee's second choice is Moon Tower after the city's iconic light fixtures, and third choice is South Congress after the school's location. The committee's first choice would be to rename the school North Central after the school's location. Its second choice would be to name the school after Diana H. Castañeda, an East Austin activist and board trustee from 1992 to 1996. According to her obituary two years ago, Castañeda was the first Latina elected onto the Austin school board. She was involved in school, city politics and women’s rights, and she made efforts to advocate for low-income communities, social justice and making public education accessible for everyone. Its third suggestion would be to remove Sidney from the school's name and just go by Lanier High School. Its second choice would be to rename the school Barack H. Obama, after the nation's first black president. Its third choice would be to rename it Northeast after the school's location. Members of the Eastside Memorial renaming committee asked for more time to propose names while the school goes through a renovation from the 2017 bond. Claire McInerny contributed to this report. Correction: This post initially said the board would be voting on name changes for five school buildings, but it will not be voting on a name for Eastside Memorial at the Oct. 22 meeting. Clarification: An earlier version of this post did not rank the schools in the order the committees proposed. The Austin Independent School District met with community members Thursday night to get feedback on whether to change the names of five district buildings. All five buildings were named for people connected to the Confederate military or government during the Civil War. The Austin Independent School District’s Board of Trustees voted Monday night to move forward with renaming five district buildings named for men who served in either the Confederate military or government. Lanier, Reagan and Eastside Memorial high schools, Fulmore Middle School and the Allan Center will get new names. Five Austin Independent School District schools named for Confederate figures will get renamed this semester. The Austin ISD Board of Trustees voted in February to rename the John T. Allan Facility, Zachary Taylor Fulmore Middle School, Sidney Lanier Early College High School, John H. Reagan Early College High School and Eastside Memorial Early College High School at the Johnston Campus (named for Albert Sidney Johnston). 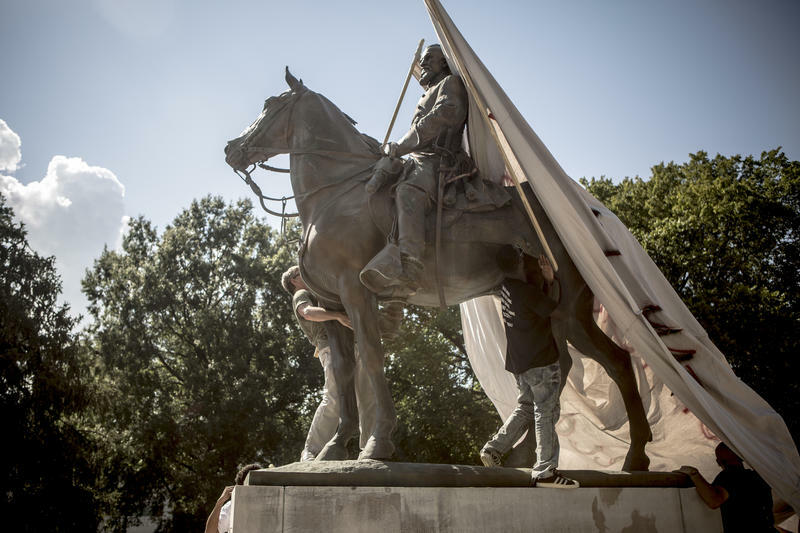 Austin’s Equity Office is recommending the city remove or change the names of streets, parks and markers in Austin that honor the Confederate States of America and slavery. The office also suggests eschewing the name “Austin” altogether, as Stephen F. Austin fought to defend slavery in the Texas Revolution and supported the institution after the state gained its independence from Mexico. The Austin City Council voted unanimously Thursday to rename two streets that had been named for Confederate figures. Robert E. Lee Road will become Azie Morton Road, after the Austin resident and first African-American U.S. treasurer. Jeff Davis Avenue will be renamed for William Holland, who was born into slavery and became a Travis County commissioner in the late 19th century. He was integral in establishing a school in Austin for disabled children of color. The Austin Independent School District’s Board of Trustees will vote in a little over a week on how to consolidate three elementary schools in East Austin. Students at Metz, Zavala and Sanchez Elementary schools will combine into once school, which the district will completely renovate using money from the 2017 bond, but parents, staff and students are still unsure what lies ahead. A group of education advocates has released what it is calling a manifesto, demanding the Austin Independent School District immediately address inequities for schools in East Austin.